Seattle Urban Sketchers hosted another sketching outing to MOHAI to see the Gabi's exhibit. 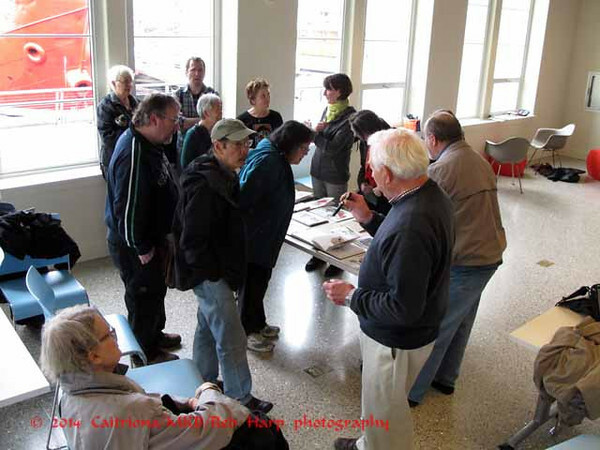 This time it was to meet up with the Portland Urban Sketchers who came up to see the show. All my photos from the day are here. I also have some more details on my personal blog. 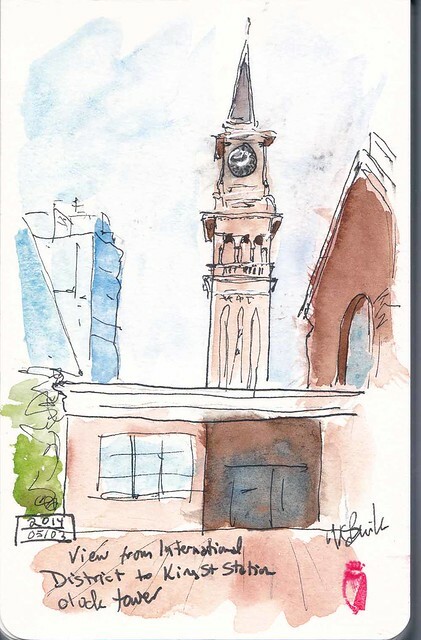 As I waited for the Portlanders to arrive on the Bolt Bus, I did a quick sketch from the International District square looking back at the clock tower of King St. Station. I had to color it later as the bus arrived early! 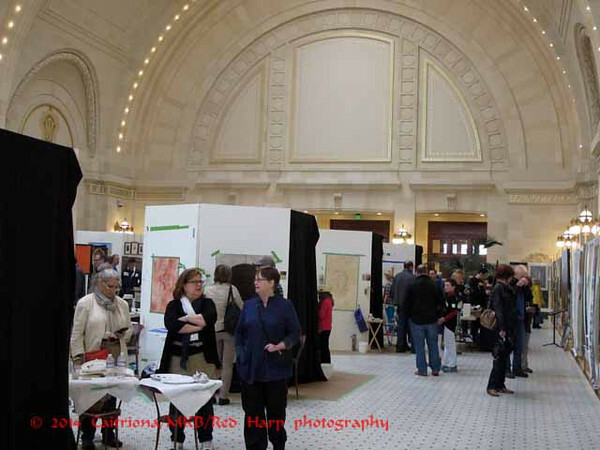 The weather was once again rainy, so most of us sketched inside the museum. 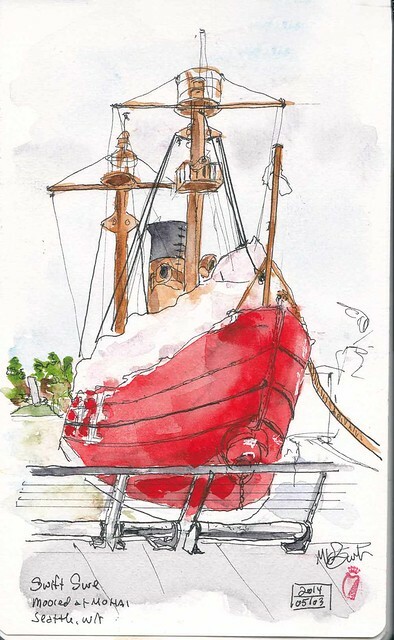 I was one of several who sketched the big red Swift Sure boat from the window of the cafe. It is a 1904 129-foot lightship, covered in plastic to protect it from the winter weather. As usual, we shared out sketches and then had a group photo. 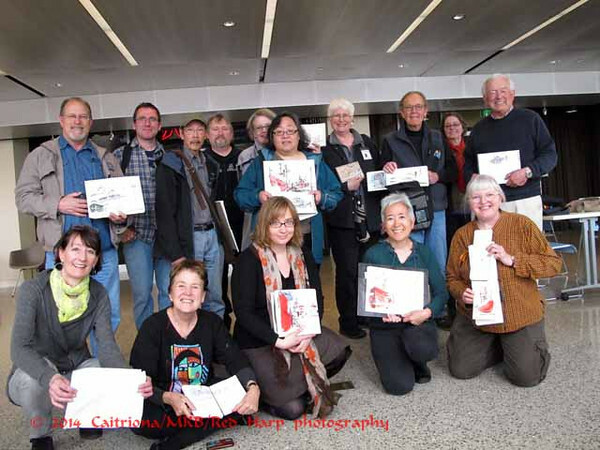 Urban Sketchers groups from Portland, Seattle, Tacoma and one from eastern WA! I finished painting my earlier sketch up in the exhibit. 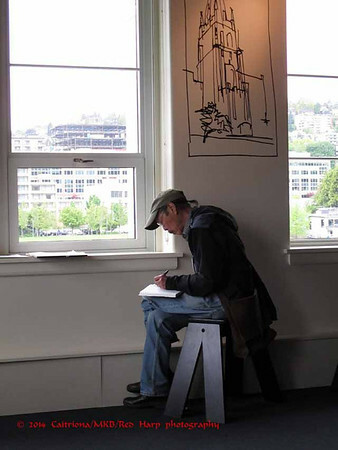 Frank Ching was there as "sketcher in residence" for MOHAI that afternoon. After lunch, I wandered the museum again. I'd wanted to sketch this case of railroad artifacts before. It was in a room with a very loud hands-on railroad exhibit. On other visits, I couldn't cope with all the noise from the kids playing with it. Today there were few children there so I took the opportunity of silence to sketch the case and the sign above. The event continues today if you want to see it. It was a pleasure meeting you and spending time together on Saturday. Thank you for your assistance in the Seattle transit system! It was a very good day despite the weather and my late arrival. Kate, lots of great photos and also GREAT sketches!! I can see the perspective :), really well done. Kate, Thanks for wonderful sketches and descriptions...and a special thanks for mentioning the Bolt Bus. I'd never heard of it. 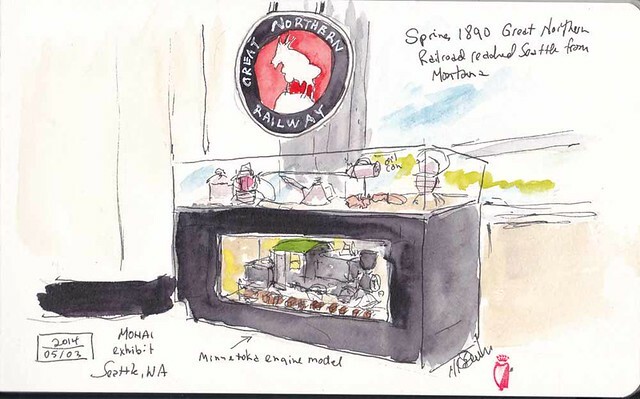 Great way to 'hop' down to Portland to sketch!